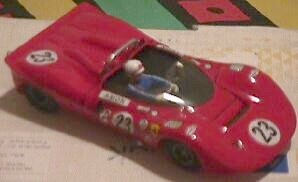 Total of brand 'Dynamic': 2 factory cars, 0 reproductions, 3 total. This manufacturer of in the 60's made an extremely "Dynamic" set of chassis parts. 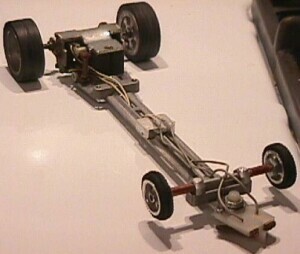 You could basically get any motor, any wheel base, and mount the chassis on pratically any body, in both 1/32 and 1/24 scale. Dynamic parts can still be found at reasonable price from collectors. Dynamic was a subsidiary of AMT. Dynamic cars are very rare. Their chassis' parts are very common, but (funny) their own cars didn't use the chassis that made them famous. These famous chassis were sold separately. 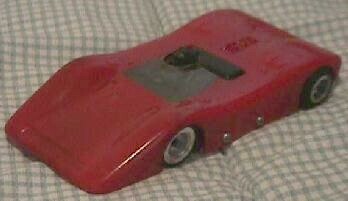 Their own cars used a angle-winder brass chassis, and are very hard to find.